Want Your Taxes Done for Free? The St. Louis Tax Assistance Program (TAP) offers free tax preparation services to low and moderate-income families to help them obtain the tax credits for which they are eligible and avoid costly income tax preparation fees. Was your household income less than $55,000 in 2018? 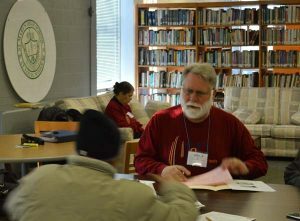 If you said yes, you’re eligible to have your taxes done for FREE by trained volunteers at any of our eight sites. Our eight site locations include 3 weekday sites and 5 Saturday sites to accommodate your schedule. Our 3 weekday sites prepare returns By Appointment Only. Visit our Locations page to view all locations and/or to make an appointment. If you would like to do your own return using Free software, just click HERE or on the My Free Taxes banner at the bottom of this page. Preventing families from taking out a costly loan against their own tax refund money, which they must do to get an instant refund through a commercial preparer.